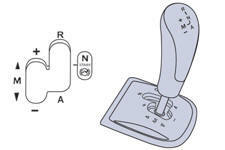 With your foot on the brake, move the lever forwards to select this position. With your foot on the brake, select this position to start the engine. M. + / - Sequential mode with manual gear changing. - push forwards to change up a gear, - or push backwards to change down a gear.